The Association of Zoos and Aquariums SSPs facilitate the breeding of threatened and endangered wildlife that are on the verge of going extinct in the wild. Micke Grove Zoo is one of many zoos which has the opportunity to be involved in these programs. Micke Grove Zoo is involved in and has successfully breeding several threatened species, which include bred golden-lion tamarins (Leontopithecus rosalia), Chilean pudu (Pudu puda), and waldrapp ibis (Geronticus eremita), marbled teal (Marmaronetta angustirostris), and western pond turtle (Actinemys marmorata). Other species such as the Prevost’s squirrel (Callosciurus prevostii) and the cape thick-knee (Burhinus capensis) have also bred successfully at the facility. Micke Grove Zoo is passionate about the contribution it makes to conserve wildlife and uses every opportunity to educate students and zoo visitors on wildlife issues. Micke Grove Zoo Gift Shop. CLOSED FOR THE SEASON. Wild Bites Snack Bar. CLOSED FOR THE WINTER. 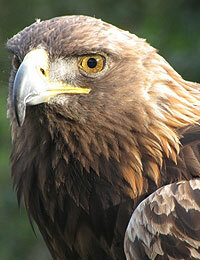 [Above] this female golden eagle became the zoo resident when she permanently injured her wing in the wild and was unable to fly.